The next lecture of the Edinburgh Geological Society’s winter series will take place on Wednesday 26 October at 7:30pm in the Hutton Lecture Theatre at the Grant Institute of Geology, King’s Buildings, Edinburgh, when Dr Tim Kearsey, BGS Scotland will talk about Palaeosols as evidence of terrestrial climate change at major Palaeozoic vertebrate evolutionary events. Climate change is a major driver of evolution. 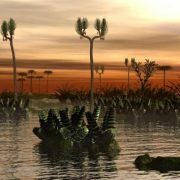 Palaeosols (fossil soils) are one of the few direct indicators of terrestrial climate and provide a record of climate changes and landscape architecture, and are critical in understanding the terrestrialization of vertebrates in the Carboniferous and the Earth’s largest mass extinction at the end of the Permian. Tim Kearsey is a survey geologist and sedimentologist with BGS in Edinburgh. He has research interests in Palaeozoic stratigraphy and sedimentology; palaeosols and palaeo-environmental reconstruction; and geostatistics. In June 2015 he was joint leader (with David Millward) of the highly successful EGS excursion to Burnmouth. On Saturday 22 October 2016, starting at 10:00am, the British Geological Survey will be holding a one-day Science Showcase entitled ‘Power of our Planet‘ at Dynamic Earth in Edinburgh. There will be a wide range of demonstrations and hands-on activities for all ages and levels of interest. This year, this event replaces the popular BGS Doors Open Day, now sadly no more since the closure of Murchison House, and it will provide a great opportunity for members of the public to meet and engage with geologists and their work. Everyone is encouraged to support this event and to publicise it to family and friends. The ‘Power of our Planet’ event is free to attend; admission to the main Dynamic Earth galleries, if desired, will incur the usual admission charges. The first evening lecture of the Edinburgh Geological Society’s winter series will take place on Wednesday 12 October at 7:30pm in the Hutton Lecture Theatre at the Grant Institute of Geology, King’s Buildings, Edinburgh, when Prof Patrick Corbett, Heriot Watt University will talk about: Fluvial Channel Reservoirs – 20 years diagnosing their reservoir engineering attributes. In 1994 the first study was undertaken to collect permeability data from opencast or surface mines in the Ayrshire Coalfields with the specific objective of generating synthetic well test responses. Well tests are undertaken by engineers on making a discovery in a fluvial reservoir to try to understand the lateral extent and size of the reservoir. At that time the tools for doing the simulation were rather simple, the models produced were rather simple and the results looked rather like the expected results in the engineering textbooks at the time. Since then, as the data and understanding have improved, as Google Earth has provided images of fluvial systems across the world, as the simulators became more powerful, the grid blocks smaller and the models much larger, and more well tests have been conducted, we begin to see that the 3-D pressure responses are much more complex. This goes, in some way, to explain why fluvial reservoirs have lower recovery (and therefore higher remaining potential) than many other types of oil reservoir. Twenty-two years later, we are still studying opencast mines in Ayrshire (the Spireslack Mine), building models and trying to understand fluid flow in complex reservoirs. Patrick Corbett is Professor of Petroleum Engineering at Heriot Watt University and Head of the Carbonates Reservoirs Group. His long-term research interests involve integration of reservoir geoscience, petrophysics, geophysics and reservoir engineering. A link to a map of the campus can be found at http://www.edinburghgeolsoc.org/l_home.html.